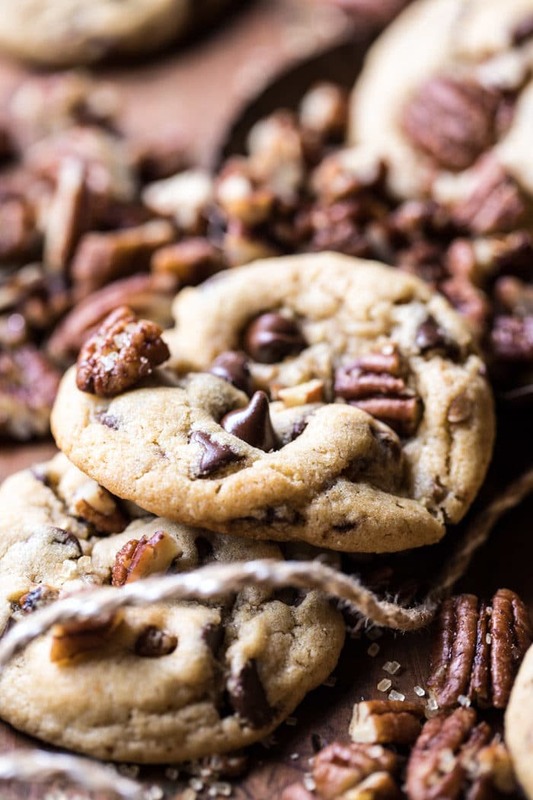 The only way to welcome in the first Friday of November is with these Browned Butter Pecan Chocolate Chip Cookies. These cookies are simply the best. 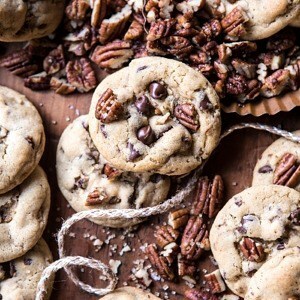 I know, I say that every time I make cookies, but really how could a cookie containing browned butter, maple toasted pecans, and semi-sweet chocolate chips not be the best? It’s pretty much just a (dangerously) winning combo. 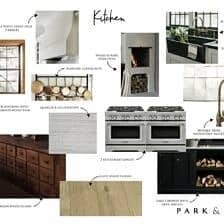 With November here, I can’t help but want to get into the kitchen and bake any time I have a free moment. This time of year of always makes me want to turn on my oven and bake. One, because I am constantly freezing and the heat of the oven warms my cold little barn, and two because I love the sweet and cozy smells wafting from the oven…especially the smell of these cookies. Truly nothing better on a cold, dreary fall night or a Saturday afternoon. As mentioned in my Thanksgiving menu reveal post this past Wednesday, these cookies are a big part of my Thanksgiving dessert table. When it comes to Thanksgiving desserts I know that everyone immediately thinks pumpkin pie. But me? When I think of Thanksgiving desserts, I think of pecan pie. It’s just what my mom always made growing up, and it’s my personal favorite. So every November I like to develop a few pecan pie inspired recipes for fun twist on tradition. You see? I really like my chocolate pecan desserts, and these cookies? Newest obsession. As you can see above, two years ago I made these butter pecan cookies, and to this day they are still one of my favorite cookies to make. I actually made them more for Christmas, but despite when they were posted, they’ve become a year round favorite on the site. 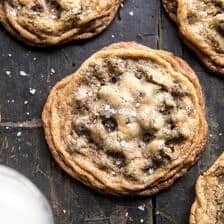 This year, when thinking up my new pecan dessert, I knew I wanted to make some kind of cookie, but instead of a crumbly butter cookie, I wanted something more like a classic chocolate chip cookie. 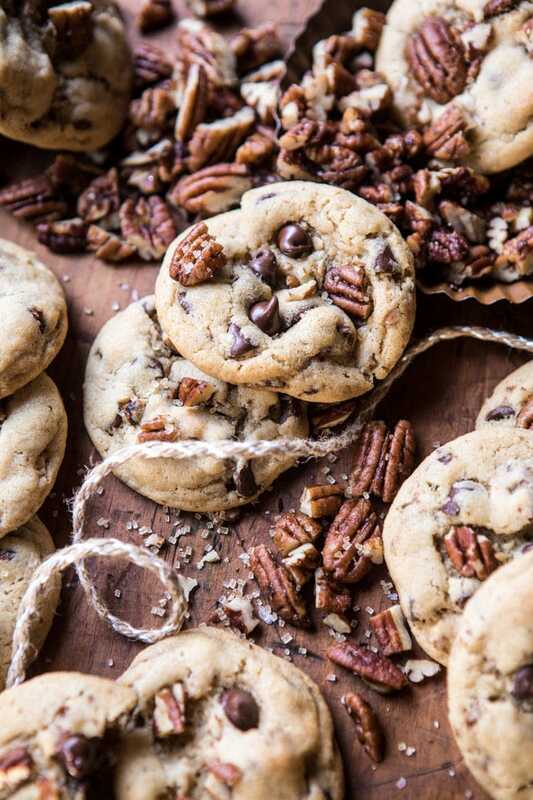 Enter these browned butter pecan chocolate chip cookies. 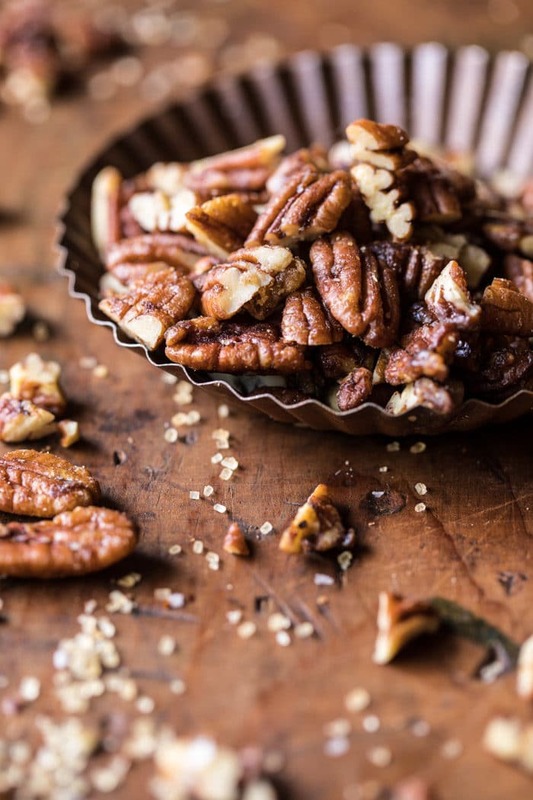 Soft, buttery, chocolatey, and loaded with maple toasted pecans and hints of toasty browned butter. I mean, come one. Do I really need to go on? 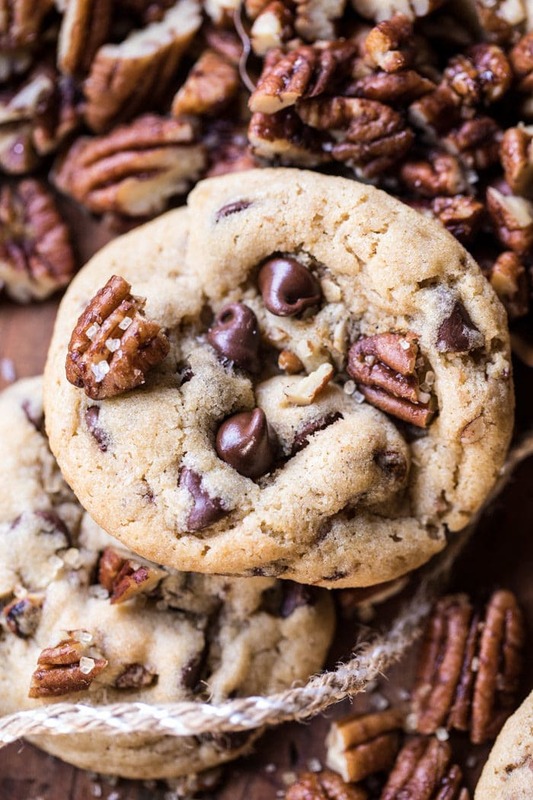 If you like chocolate chip cookies and you like pecans, you will hands down love these cookies. And you know what? After testing this recipe multiple times (literally like six batches in two days), I discovered that the easiest, quickest method turned out the best. Meaning, no crazy methods or seventy-two hour chill time. No, none of that, instead you can have these cookies baked and ready for eating in about thirty minutes or so…and now you understand why they are dangerous. I’m spending the weekend prepping for my trip to NYC on Monday, but hope to take some time tonight to do a little Friday baking. It’s my favorite way to unwind after a long week. These cookies are obviously on my list for the night…and will be eaten warm out of them oven with cold milk…the only way to do cookies on a Friday night. 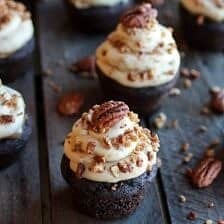 Soft, buttery, chocolatey, and loaded with maple toasted pecans and hints of toasty browned butter. Baked and ready for eating in about 30 minutes...the perfect holiday cookie. 2. To a skillet set over medium heat, add the pecans and maple syrup. 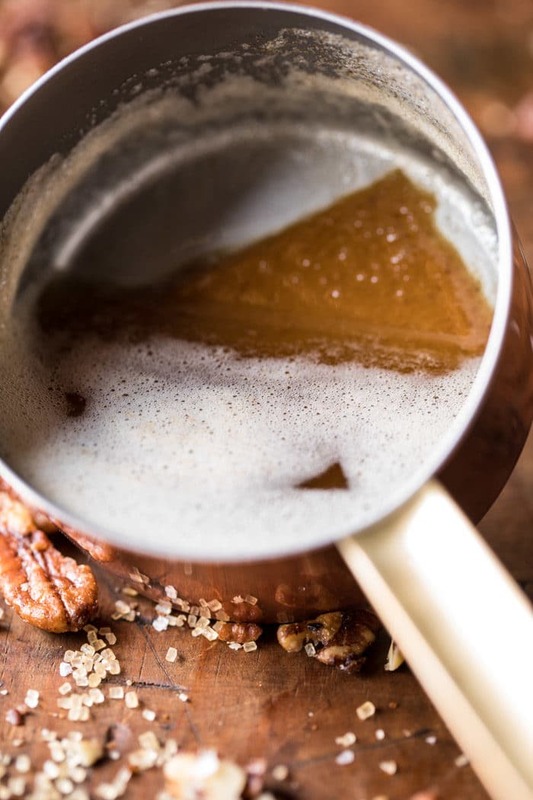 Cook, stirring often, until the pecans are toasted and golden, about 5-8 minutes. Remove the pecans from the pan to a cutting board. Sprinkle with flakey salt. Let cool and then roughly chop. 3. Add 1 stick butter to a skillet set over medium heat. Allow the butter to brown lightly until it smells toasted, about 2-3 minutes. Stir often. Remove from the heat and let cool. 4. In a large mixing bowl, beat together the remaining 1 stick butter, cooled browned butter, brown sugar and sugar until combined. Beat in the eggs and vanilla, beat until creamy. Add the flour, and baking soda, beating until combined. Stir in the the chocolate chips and chopped pecans. 2. Roll the dough into tablespoon size balls and place 3 inches apart on the prepared baking sheet. 4. Transfer to the oven and bake for 8-10 minutes or until the cookies are just beginning to set on the edges, but still doughy in the center. Remove from the oven and let the cookies cool 5 minutes on the baking sheet. They will continue to cook slightly as they sit on the baking sheet. Sprinkle with coarse sugar, if desired. Eat warm (highly recommended) or let cool and store in an airtight container for up to 4 days. 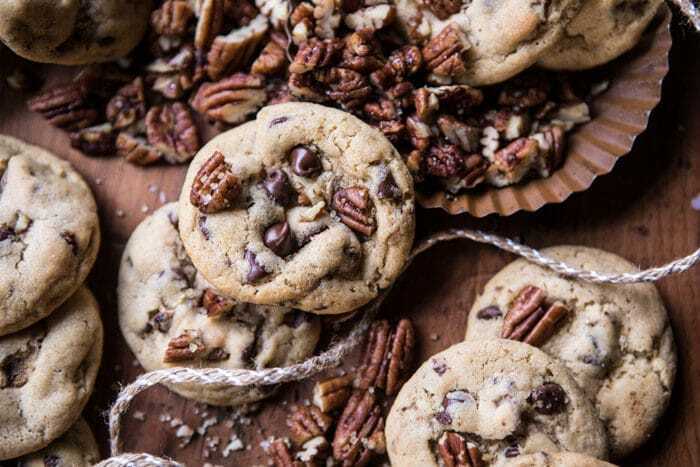 Because again, it’s November and we all need a good pecan loaded chocolate chip cookie. It’s true. WE DO. Slice N Bake Vanilla Brown Butter Pecan Cookies…Dipped in Chocolate. 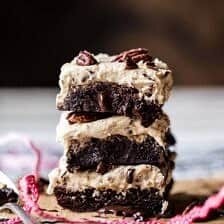 Butter Pecan Frosted Fudge Brownies. 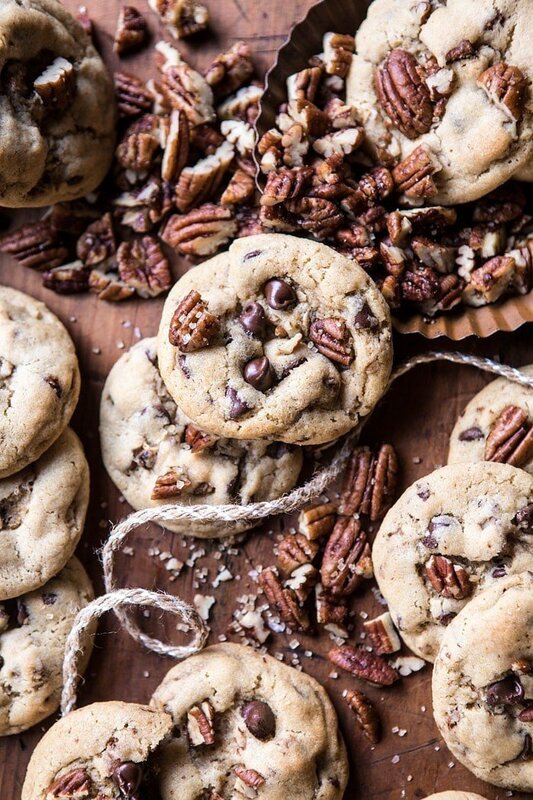 YES YES YES to these cookies (and the weekend). I could use a few of these right now!! Yes! You should try these Ruth! Haha, I experience the same feelings as you at the beginning of December. I want my oven to be running nonstop, because a) it heats up our freezing apartment, b) the smells of baked goodies evokes the holiday spirit. Six batches? Seriously? That’s extremely dangerous! I don’t get it.. how do you still manage to stay fit and slim?! I’d look like a giant snowball if I was living near you.. I love chocolate (but try to avoid it), all kind of nuts and this recipe makes me drool 🤤🤤 Nice one again, Tiegh! Haha yes I love standing by my oven when it is cold in my house.. seriously the best! I am sure you will love these, so definitely give them a try! And yes it makes a lot but they’re so good and I share with my family! I hope you love these, thanks! Haha glad you like these! These look like the most perfect choc-chip biscuits 😍 Going to add them to my Christmas cookie list for gifts! That sounds like the perfect gift! I mean who wouldn’t want cookies?! Thank you & I hope you love these! Store up to four days? Seriously????? Who are you kidding? They would not last four hours at my house. Haha I am really glad you are liking this recipe Karen! Thank you! Yes perfect for Friday! I hope you love these Joyce! I wish I could open my doors to a big gust of warm air haha! I am so glad you are liking these cookies, I hope you and your mom enjoy baking these! Thank you Kristin! Oh my gosh Tieghan!!! These sound amazing!!! Absolutely Gorgeous! and so yummy! 1st comment missed the 5 star rating, so here it is! Thank you Sabell! I am so happy you loved these cookies! Can’t wait wait make these!! Have you ever tried freezing your dough? If so, how should I adjust cooking times and how long will they last? 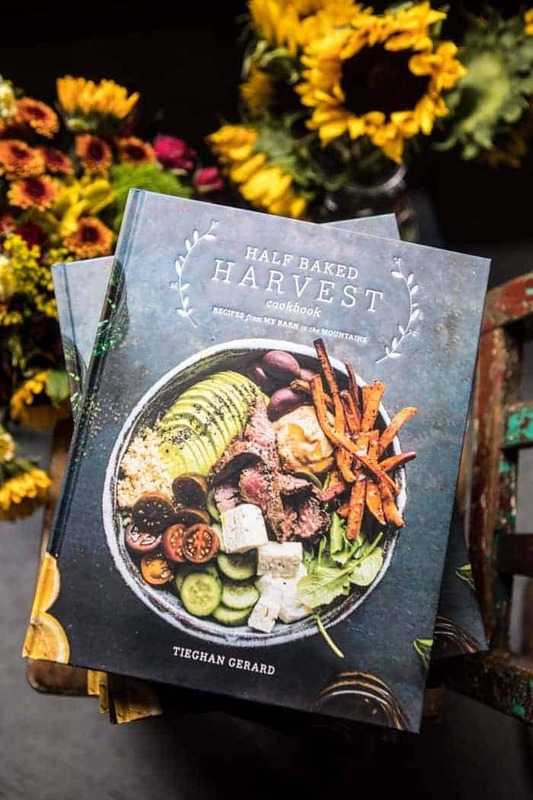 I just bought your cookbook (!!) and made the oatmeal CC cookies once I opened it up. I balled up and froze half the dough but haven’t tried to bake them since. PS. Hope you are loving the book!! so i finally managed to find some butter on yesterday and i was like ok i’ll finally be able to do those cookies and then i find this recipe… the only slight problem could i maybe just add some more salt to the recipe since i have normal and not salted butter on hands? First, I love your blog! Can you tell me why these did not flatten out while baking? I followed the recipe. The 2nd batch I put in the oven, I flattened the balls slighty. THey still did not flatten out as shown in your picture. What can I do differently? I love a flat cookie! These cookies are amazing. I️ doubles the batch and had to add an extra cup or so of flour because it felt way too Soft. I️ didn’t add all the pecans and wished I️ had. I️ added half the amount of chocolate chips. Absolutely wonderful! Thanks for sharing. I am so glad you loved these! Thanks Nicole! I swapped the pecans in these for slivered almonds. Annnnd I don’t think I will be able to utilize any not stretch yoga pant items for the next several days due to my absolutely shameful lack of self control. Haha I am so happy to hear you have enjoyed the recipes on my blog Jess! Thank you! This Friday is my birthday.Will do this and serve my friends as my birthday gift.Thanks for sharing.. Happy Birthday! I hope you love this! made these tonight! just wow! soooooo good. love love love. That is so amazing! Thank you Jacki! Made these on Friday and they did not disappoint, best Chocolate Chip cookie I ever ate! My family loved them! Another excellent recipe! You need your own cooking show! I am so glad you loved these Donna! Thank you! So excited to try these for the holidays! 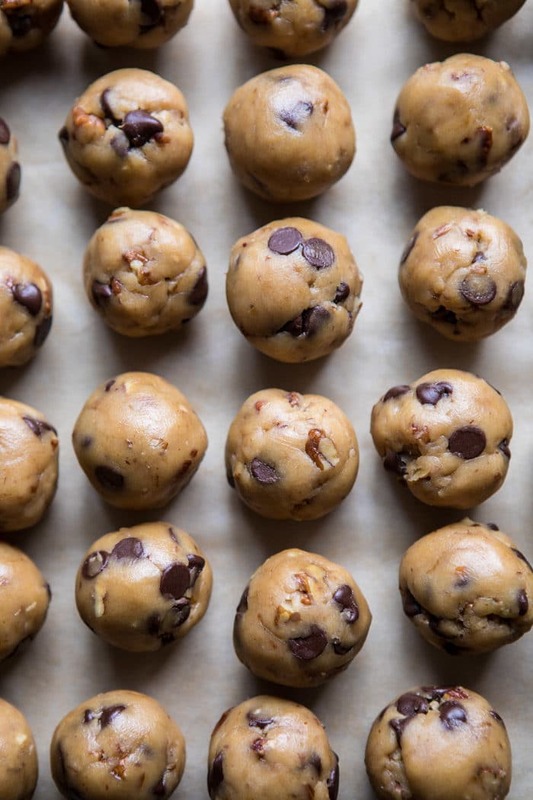 Do you think I can freeze extra cookie dough for quick baking in the future? I really wanted to love these. I mean how could I not? They have chocolate and pecans…two of my FAVORITE things, but after making them I felt they lacked depth of flavor. I candied the pecans, browned the butter, and still they were just “ok.” Even the cookie dough was just “ok.” I thought it may have that the cookies were slightly too sweet, so the next time I made them I used half semi-sweet and half dark chocolate chips, but still they we’re just “ok” and didn’t have that “wow” factor I was hoping for. On several batches I sprinkled with course sea salt after baking, and it helped, but still just “ok.” 😢 I doubled the recipe and used a cookie scoop, and ended up with nearly 8 dozen cookies. Hi Whitney! Sorry these did not work for you. I hope you enjoy some other recipes on the blog! 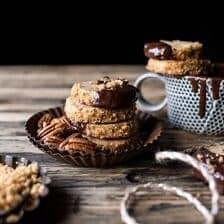 So I just recently discovered your blog and made these cookies along with 3 other desserts from your blog and they were all beyond DELICIOUS!!! 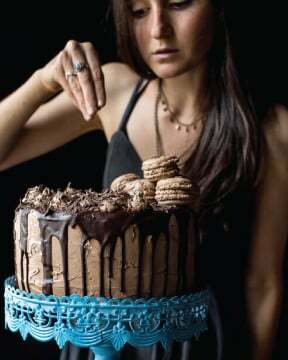 You are my new favourite baker in the history of baking, thanks for making the research process easier! Your blog is my new go-to place! Looking forward to buying your book! I am so happy you enjoyed these Nicole! Thank you and I hope you love the book! Hi! I followed the directions, but the cookies did not flatten out. What could be the reason? Hi Nejwa! It is hard to say what exactly went wrong. Is the baking soda you used fresh? That may be the reason. Please let me know if you have any questions! Yes, the baking soda was fresh. So I think I might know why…I used a tad bit more flour because it was so sticky I couldn’t form the balls. Could that have been it? If so, I have leftover dough that I put in the freezer, should I add more butter to that? Thanks for your help! Everything I want my chocolate chip cookies to be: buttery, sweet, salty. A little crunch on the edges and a whole lotta gooey goodness in the middle. Could not get these away from my husband nor my 14-mo-old twins. As you said, ‘Dangerous’. Thank you! Haha that is too great! I am so glad you and your family loved this recipe, Jackie! Thank you! 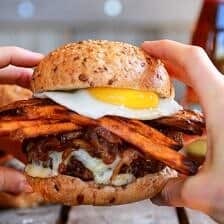 I have made this recipe several times and have loved it! I do not eat regular sugar, so I substitute coconut sugar instead and do 1 cup white flour, 1 cup wheat. I also do 1 cup carob chips and 1 cup semi sweet. Best recipe ever!!! Thank you!!! Thank you so much Sarah! I am so glad you loved this! Can you use regular maple syrup? Recipe sounds great! 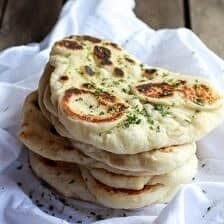 Could you brown both sticks of butter for this recipe and then either refridgerate the butter until it becomes solid or refridgerate the dough before baking? No a bad cookie, but I felt it was missing salt, and it did ot have enough sugar. I’m going to try again, but with 3/4 cup of white sugar, instead of 1/3 cup. And of course salt. I thought it would be cool to step outside of my zone after all of these years, and use a different recipe. It didnt work out for me. I do like the idea of the brown butter though. Hi! I am so sorry this did not work for you. Is there any questions you have? I hope you try these again with some more sweetness and salt! I made this recipe this past weekend and while the cookie dough tasted amaaazing (couldn’t stop eating it!) unfortunately the cookies did not flatten and seemed dry and not crumbly on the outside or gooey inside. I did read about this issue in previous comments so I bought fresh baking soda but still had the same results… now, my flour on the other hand was not new.. do you think that could have been the issue for me? Also I beat the dough in the standup mixer and slowly added the flour while the mixer was on, so could that have over mixed the dough? Is there such a thing? (I’m not a baker but I know you’re not supposed to over mix muffin/cake batter… does that go for cookies as well? Sorry, so many questions here but I really want to give this cookie another try and hit it out of the park!! Thank you! Do these cookies freeze well? I’m looking for a recipe I can make this week and freeze until Christmas. These cookies are delicious!! I made a batch two weeks ago, my husband and I ate the entire batch over the following week (LOL). I plan on making more to share with my friends and family this Christmas. Thank you so much! Hi Kaity! I am so glad you loved these cookies and I hope your family loves them for Christmas as well! These are delicious! I was nervous because my dough wasn’t sticky enough to roll into balls so I dropped them and only cooked six to test them out. They still turned out like the photo and delicious! The browned butter and salt gives them a special something extra! I couldn’t really taste the maple, but it probably provided some depth too. I’d for sure make these again. They were supposed to be for Santa, but I made them two days early because they were calling my name! I only changed chips to chunks and I only had 1.5 sticks of salted butter so I used that and .5 unsalted so I sprinkled with a little salt instead of sugar. They were perfect! I am SO happy these turned out perfectly for you, Heather! Thank you so much! I made these a few days ago with honey (which I had on hand) and a mix of semi sweet and milk chocolate chips (out of habit) and the combination was way too sweet, but the texture was great, so I tried again this morning. Much better result. If I find myself forced to use honey, I might also lower the sugar content and use a more bitter chocolate and few chips. Great recipe! Thank you so much! I am so glad you enjoyed these cookies, Ana! Thank you Tina! I am so glad these turned out so well for you! Trying these cookies for the first time. The recipe looks pretty nice. Thank you! 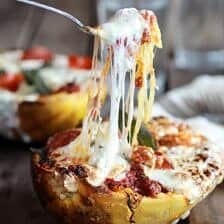 I have made these quite a few times now and they are AMAZING! When I don’t have pecans on hand, I use this as my basic chocolate chip cookie recipe and throw in a half cup more chocolate chips and a dash of salt. I searched years for my perfect chocolate chip cookie recipe and I finally found it! These cookies are amazing! I think they are my new favorite. It ended up making 4 dozen rather than 2, which was a nice surprise but I always make my cookies on the smaller side. I brought a dozen into work and my coworkers were raving about them, and I was more than happy to turn them into Half Baked Harvest! I did end up with a bunch of leftover chocolate chips that wouldn’t incorporate into the dough, so in the future I might cut back to 1 cup of chocolate chips. But I have a feeling I’ll be making these again soon!